The battle royale gets bigger with the latest LTM and hotter with the newest skin, Burnout. We’ve honed in on performance and quality of life changes, addressing many of the minor issues that have surfaced from the last few patches. We’ve seen your colossal Hoverboard courses and are blown away by the effort put into them. We want to see more, and are going to keep expanding the feature by adding more tools to play with! Lift off with Boost Pads, Save the World’s newest item that accelerates the Hoverboard. Bigger teams, bigger battles! Five teams of 20 fight for the Victory Royale. All roads lead to Victory. Blaze your path with Burnout. 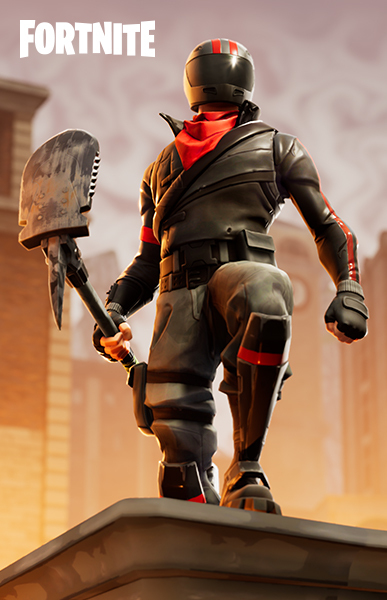 Prepare to leave Husks in the dust! These boost pads send the Hoverboard flying, making your race tracks... gnarly! This Hero is definitely not monkeying around! Available in the Event store now. Fixed a Texture Streaming Crash for all platforms. Fixed Farm details not rendering from far away. Fixed the "Accept" and "Back" button swap issue. Storm Circle 1: Random location. 120s wait, 180s shrink time. Storm Circle 2: Random location. 120s wait, 90s shrink time. Storm Circle 3: Location centered on previous storm (for the rest of the match). 120s wait, 90s shrink time. Storm Circle 4: 120s wait, 60s shrink. Storm Circle 5: 180s wait, 60s shrink. Storm Circle 6: 120s wait, 120s shrink. Added Easy Anti-Cheat protection to PC. Some players will be run through Easy Anti Cheat and some will be run through BattlEye. Installation will occur while Fortnite is running. Brazil has been added to the Matchmaking Region selector for Xbox One players. To adjust this, head to Settings > Game > Matchmaking Region > Brazil. Fixed an issue where the ‘Reset Building Choice’ option would not reset to Walls if Traps were last selected. All teammates will be displayed in green on the map. The Map screen now shows total number of players alive on each team. Supply Drops always come in batches of 5 instead of varying amounts per Storm Circle. Supply Drop rate increased from 180 (+/- 30s) to 210 (+/- 30s). Teams of 20 has six Storm Circles as opposed to nine. Maximum match length is 23 minutes, down from 25. Storm Circle 1: Random location. 60s wait, 180s shrink time. Storm Circle 2: Random location. 60s wait, 90s shrink time. Storm Circle 6: 240s wait, 120s shrink. Players will get elimination credit for forced fall damage either through Impulse Grenades or destroying structures underneath their enemies. Breaking the base of a structure will count the same as breaking the exact piece a player is standing on before they fall. Riding a rocket no longer cancels emotes or using consumables. Lobby emotes will now play out instead of just ending at 5 seconds. Fixed an issue where players at 60 FPS could not jump as high as those playing at 30 FPS. Fixed an issue that prevented weapon tracers from being visible after a certain distance. Fixed an auto-sprint issue that would cause players to continue sprinting when they tried to stop. Fixed issues with the Hunting Rifle’s accuracy. Now uses perfect accuracy when aiming and not moving. Hip-fire remains unchanged. Fixed an issue with accuracy reticle UI being slightly mismatched. Fixed additional weapon loading issues that prevented players from being able to see or use their weapon while the world was loading. Fixed an issue where firing a weapon could cancel the equip animation. Fixed the kitchen cabinets that were placed outside of some houses. They are now back inside where they belong. Increased the HP value of Weeping Willow trees so it is more representative of the amount of resources it gives. Fixed an issue that sometimes caused an inventory slot to be unusable. Fixed an issue where players would have to press the ‘Leave Match’ button twice when exiting an in-progress match. Fixed an issue where squad members could be missing from the top panel when opening the in-game menu. Fixed a crash that would occur when closing the game after opening the settings menu. The Pump Shotgun’s pump animation will now play when held up instead of at rest. Distant buildings and objects now connect to the terrain more smoothly. Improved terrain rendering and cloud shadows. Fixed an issue where Glider trails were not visible to other players. Fixed an issue that prevented destruction effects from playing while on low effects settings. Added squeaks to wood, stone, metal, and default hits for the Pick Squeak harvesting tool. Improved the default glider and umbrella open sound so that it syncs up with animation. Added an audio cue that will play when squad members jump from the Battle Bus. Improved the Epic/Legendary Assault Rifle close-range fire sound. Fixed a crash that would occur when unplugging headphones. Fixed an issue that would cause tactically important sounds to occasionally be cancelled. Fixed hitching when certain player outfits were loaded in the middle of the match. Fixed crashes that could occur in rare cases when using the NVIDIA ShadowPlay Highlights feature. Added the Boost Pad schematic as an additional quest reward for ‘Want to Build a Hoverboard?’. 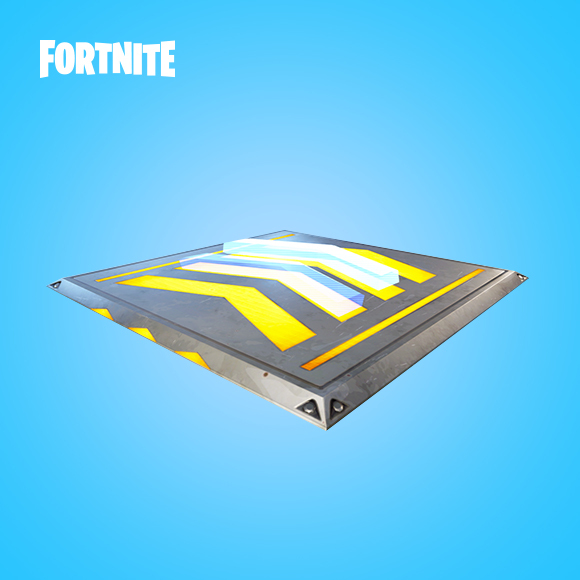 This new floor trap pushes your Hoverboard in the direction of the chevrons. Time to build some high-speed race tracks! Players who have already completed this Quest will automatically receive this reward. Added Boost Pad as a World Drop. Added Cozy Campfire Trap as a World Drop. All Group Missions now have Mission Alerts that award Firecracker Tickets. Firecracker Ticket amount awarded is scaled based on difficulty. Can play the same Group mission hex multiple times. Quota: Only 10 Group Mission Alerts per day will grant tickets. Group Missions now include Fight the Storm Category 1,2,3, & 4, Retrieve the Data, Ride the Lightning, Evacuate the Shelter, Repair the Shelter, and Deliver the Bomb mission types. Mission availability is based on player progression. Each mission threat level now has its own attribute caps, instead of a single cap for an entire location (Stonewood, Plankerton, etc).This should give players an experience closer to our intended difficulty curve when playing down-level. Many missions that were previously ‘grey’ on the map and awarded no XP will now be ‘green’ and award XP at a reduced rate. Decreased the XP fall off when playing these lower-level ‘green’ missions to make it easier to make progress when playing down-level. Group Missions now require Storm Shield Defense Quest progression to unlock. As foreshadowed in the 2.4 patch notes, completed expedition rewards may not be claimed while Storm Shield Storage is in overflow. In order to protect player data, it is essential to enforce limits on inventory size. Given a choice of dropping rewards or delaying access, we opted for delay. Completed expedition rewards are not lost and may be claimed once your storage is within capacity again. It is no longer possible to temporarily mount the Hoverboard if the mount button is held down for more than 2 seconds while in build mode. It is no longer possible to craft ammo while on the Hoverboard. Fixed a cosmetic issue where yellow missions were prematurely disappearing from the mission map. Fixed Smashers and Mini-Bosses being able to damage mission defense objectives. A more detailed description added to the ‘Double Trouble’ Spring it On! quest. Fountains in ‘Change of Luck’ Spring it On! drop more quest items per fountain destroyed. Critical Damage vs. afflicted targets increased from 45% / 67.5% / 90% to 67.5% / 101% / 135%. Critical Chance decreased from 14% / 21% / 28% to 11.5% / 16.5% / 21%. Critical Damage increased from 30% / 45% / 60% to 45% / 67.5% / 90%. Recoil changed from -20% / -30% / -40% Reduced Recoil to +20% / +30% / +40% Weapon Stability. Heavy Attack Cost changed from -9% / -13% / -17% Heavy Attack Energy Cost to +10% / +15% / +20% Heavy Attack Efficiency. Fire Rate increased from 12% / 18% / 24% to 14% / 21% / 28%. Reload Speed increased from 15% / 22.5% / 30% to 25% / 38% / 50%. Clip Size decreased from 30% / 45% / 60% to 25% / 38% / 50%. Durability Decay increased from 10% / 15% / 20% to 14% / 21% / 28%. Max Durability increased from 8% / 12% / 16% to 14% / 21% / 28%. Reload Speed increased from 12% / 18% / 24% to 14% / 21% / 28%. Critical Chance decreased from 14% / 21% / 28% to 11.5%/16.5%/21%. Critical Damage increased from 30% / 45% / 60% to 45% / 67.5% /90%. Fixed an issue where rare and uncommon trap perks would appear at incorrect frequencies. 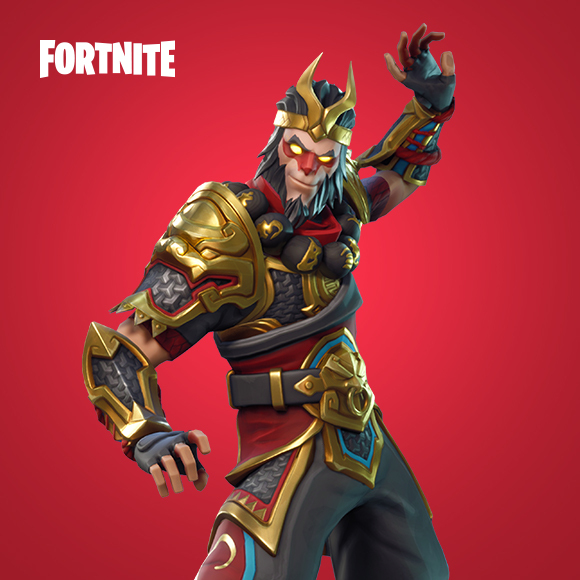 Wukong is available in the Event Store. This is the Mythic version of the Lunar New Year ‘Berserker’ soldier. The Demolisher Soldier has three new festive looks for St. Patrick’s Day. Three new St. Patrick’s themed Legendary Demolisher Soldiers have been added to the Spring it On! Llama. The Support Perk for the Berserker Soldier subclass has been changed from ‘Quick Shield’ to ‘Assault Damage’. Increases assault weapon damage by 12%, 18%, and 24% at evolutions 1, 2, and 3 respectively. Fixed an issue which could cause players to be unable to equip a gun after dying in ‘Goin’ Commando!!!’. Fixed an issue which didn’t allow ‘Frag Grenade!’ to be thrown through small windows. A button has been added to the Survivor Squad screen that allows players to easily clear all slots in the squad. Improved the Batch Recycle / Retire screen so that players can more easily tell which alerts map to the selected items. Damage numbers for the Energy damage type now have their own unique visuals. Players can now toggle the grid view when looking at Schematics, Heroes, Survivors, and Defenders in the Armory. Fixed an issue where players joining via matchmaking would show up with a Homebase power of 1, no name, and no banner when opening the main menu. The Truck Slot 2 research node in the Research 2 skill tree page now costs 1600 Research Points (was 3700).